UPDATE (7/21/09): Congrats to readers Missy and Adriana for winning the other two giveaway prizes. UPDATE (7/15/09): Congrats to Twitter follower jjeterr, who was first to correctly answer the question I tweeted and who wins one of the giveaway packages. The nice people at Erewhon (pronounced "Air-Wahn") contacted me after my recent mention of the company's two new gluten-free cereals to see if I was interested in featuring their products in a Goodies Giveaway. I gladly agreed, since my older son already enjoys the gluten-free version of Erewhon's Crispy Brown Rice cereal and I like their Rice Twice cereal. I like that all of Erewhon's gluten-free cereals are made from organic grains and are free of artificial additives and high-fructose corn syrup. More information about Erewhon's product line is available at erewhonglutenfree.com. The products are available at natural food stores, in the cereal or natural food sections of many supermarkets, and online at Amazon.com. Cocoa Crispy Brown Rice NEW! 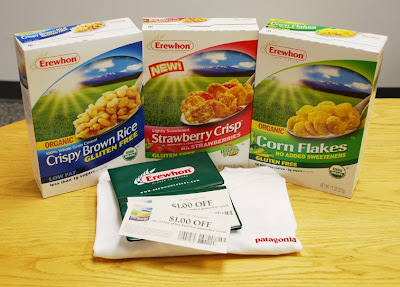 I will randomly select two of the winners from those readers who write a comment to this post, telling me which three cereals they want to receive along with the shirt size they want. The third winner will be the Gluten Free Philly Twitter follower who is first to correctly answer a question I post later this week. Some quick guidelines: (1) please do not enter unless you or a family member are on a gluten-free diet; (2) one comment per person; (3) U.S. residents only. Most important, make sure your comment or tweet provides a way for me to contact you. If your commenter or Twitter ID does not link back to an email address, blog or website through which I can get in touch with you, post your email address in the comment or tweet in the following format: "name[at]domain[dot]suffix." The commenter giveaway will be open until this Friday, July 17, at 11:59 p.m. Eastern Daylight Time. I'll contact the winners over the weekend. If I don't hear back from the winner(s) by next Monday night, I'll choose another person or persons. For the Twitter giveaway, I will post a question at @gfphilly on Wednesday, July 15 at about noon Eastern Daylight Time. The first follower to correctly answer my gluten-free related question will get a giveaway package. That winner cannot also be eligible for the commenter giveaway. Michael, I'm a newly diagnosed celiac mom who formerly loved Special K with red berries, so I'd be really interested in the Brown Rice with Mixed Berries cereal. I'd also like the Corn Flakes for a couple of favorite recipes and the Rice Twice for rice krispie treats. I would like to have a large t-shirt, but am also really excited about the opportunity for coupons on gluten free foods. I haven't had much success finding any so far! Thanks! I just started reading your blog regularly, and I have to thank you for allowing me to live a fun and delicious gluten-free life in Philly! The first few years of my GF diet were quite difficult, as the options were slim to none. Now, however, the choices are quickly increasing, and I find myself getting excited about trying all of the new products and combining them with my GF baking. I would love to try the Rice Twice to use in my GF rice pudding. I would also be interested in the Brown Rice with Mixed Berries cereal, as I often make my own GF Trail mix, and that might work well in it. Thanks again for keeping all of the GF community in Philly updated on the latest and greatest in the Gluten-Free world! I'm expecting a visit from my 5 year old celiac granddaughter at the end of July. I need all the information that I can get so that I can accommodate her needs during our shore vacation with her sibs and cousins who do not need a GF diet. I'd like the Corn Flakes, Brown Rice with mixed berries and Rice Twice. An XL shirt for my son-in-law would be great. Thanks!